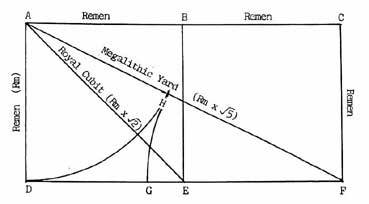 It may be seen that, from the basic square side of the Remen, the length of the Royal Cubit can be derived by multiplying the Remen by the square root of 2; similarly, the Megalithic yard can be derived by multiplying the Remen by the square root of 5. It will be necessary to examine this postulate in some depth because mensuration based on this 2 x 1 rectangle has been found on four continents  Africa, Asia, Europe and America  and almost invariably with its roots in the basic Egyptian quantum, the Remen. Ivimy gives the remen a standard length of 370 millimetres (mm), a figure that we are happy to accept although, in more detailed studies, we have found it to vary from 0.370 0 metres (m), or 370.0 mm in, for example Mohenjo-daro in Pakistan to 0.370 4 m, or 370.4 mm in the early Egyptian Mastabas and Pyramids. Within this span of four tenths of a millimeter (or, approximately, one sixth of an inch), we have located twenty-two other world-wide measurements belonging to this genre.